Chief Justice Irene Mambililma, who occupies the coveted position of being at the apex of the Zambian judicial system, the ultimate custodian of the Zambian constitution faces her greatest test as the peculiar circumstances of the 2016 general Election stare her in the face. From her vantage position, one can only conclude that she has been keenly following the issues in the pre, during and post August 2015 election period and armed with her experience as former Director-General of the Electoral Commission of Zambia, is more that equipped to make a fair judgment on the current impasse between the UPND and Patriotic Front in as far as justly determining who won the 2016 election and make a firm ruling on the matter of the Presidential petition and conduct of the Constitutional Court. Mrs. Mambilima knows the political maneuvers that have been at play from some overzealous members of the executive as well as the legal/constitutional issues that are at stake in setting precedence on the Zambia legal system going forward. It is evidently clear that the Judicature, the Zambian Judicial system, especially the Constitutional Court, is in a crisis. The Constitutional Court in particular has abrogated its role as the expert arbiter of the Supreme Law of the land and has displayed shocking levels of incompetence, and as Muna Ndulo states, “an unbelievable levels of mediocrity and is an embarrassment to Africa and the rest of the world”. What is disheartening and frightening is that for Opposition parties and citizens alike their constitutional right to enforce their guaranteed constitutional rights is not only denied but is non-existent. What hope, if a government can disobey its own laws and men and women in robes can act without principle and integrity in aiding the collapse of state institutions because of cronyism, patronage and self-interest? This kind of lawlessness if not reigned in of its excesses, knows no limits. And the only way this lawlessness will be entrenched is when the citizens become passive, timid and say nothing. The reasoning of Justices Mulonda, Mungeni and Sitali to say the least, is shocking and defies logic and lacks a point of reference at law from around the world. As a result of this, the petitioners have been denied their day in court as guaranteed under the Zambia constitution. Their right to be heard has been infringed upon and abused. The position taken lacks merit and justification on the part of Justices Mulonda, Mungeni and Sitali. Surely extra judicial factors were at play here. The three Justices elected to adjourn sine die one of the critical components of the petition when petitioners made an application pursuant to 104 (3) which asked the Court to order in line with the constitution that the Speaker of the National Assembly act as president during the duration of the election petition. Article 104 (3) clearly states that: “Where an election petition is filed against the incumbent, under Article 103 (1), or an election is nullified, under Article 103 (3) (b) the Speaker shall perform the executive functions, except the power to- (a) make appointment; or (b) dissolve the National Assembly. The judges as Muna Ndulo states “did not provide a remedy that is provided at law and simply dismissed application after application from the petitioners”. The remedy to dismiss a petition is not provided for in the Constitution because there are only two avenues before the Con-Court in Article 103:3 “That the Con-court may after hearing a petition declare as valid the election of the President or nullify the election”. This despite the fact that throwing out the petition and denying the petitioners their right to be as they did is not provided for in the Constitution. On the question of the 14 day period, Article 103 (2) provides that “The Constitutional Court shall hear an election petition relating to the President-elect within fourteen days of the filing of the petition.” Here we see a failure to apply and be in line with the spirit of the law. What the Con-Court did was to apply the literal element of the law. The spirit of the law marries both the hearing and determining elements. And this should and must have been the applied principle and character. Article 103 (2) should not have been used as a panacea to interpret and to deny petitioners their constitutionally guaranteed rights to be heard. The Con-Court a failed to live up to the expectation of being a hearing that guaranteed fair and equitable platform and not a façade exemplified by the Court in this matter of the petition. 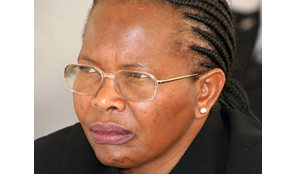 In the current petition or lack of it, It is assumed that you Madam Chief Justice Mrs. Mambilima has been keenly following all the arguments of this case, on both sides of the divide, on all pre, during and post-election events and public debate to have by now formed a firm position of what is at stake in order to properly guide the nation at this very crucial hour. If as a country we take a wrong turn now, the country risks sinking into an abyss of un-imaginable lawlessness and you Madam Chief Justice Mrs. Mambilima holds the future of Zambia’s constitutionalism in your hands.